Work on the section of Route 9 that leads to the Durham Bridge construction site will be completed by the end of the month or early in March, the resident engineer from the Maine Department of Transportation said. The state is working with contractor Wyman & Simpson Inc., of Richmond, on a $6 million project to replace the Durham Bridge over the Androscoggin River, and a $2 million job to excavate and rebuild a quarter-mile section of Route 9. Glenn Philbrook, the resident engineer, said that Wyman & Simpson has removed trees along the river side of Route 9, so that workers can begin to fill in the sunken slope with heavy riprap. Excavation work on the road began in December 2014. Philbrook said that the new bridge next to the old one – which will be torn down – will be open prior to July 4. 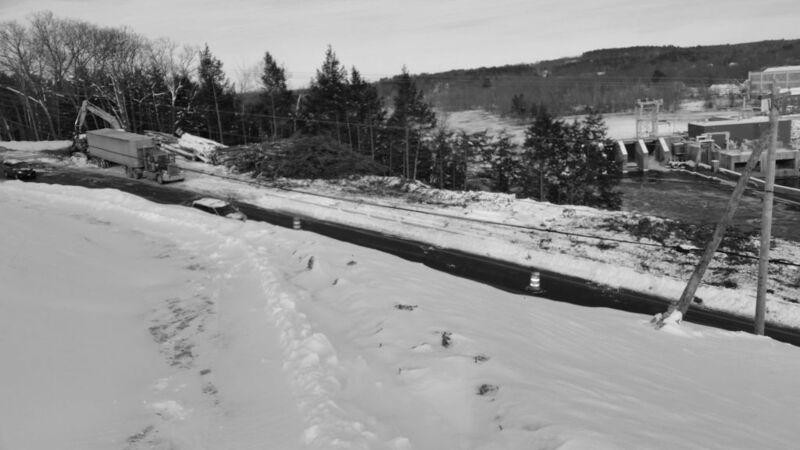 Workers have removed trees from a section of Route 9 facing the Androscoggin River, so that the road can be stabilized as it leads to the new bridge under construction.